I was delving deep into my archives for some old records, and I found the oldest piece of personal artwork I know of, a poem and drawing I made when I was 10 years old. I can find nothing I created that is any older than this little scrap of paper. It’s a pale purple mimeograph, I vaguely recall this was from a class assignment to write a little poetry magazine. 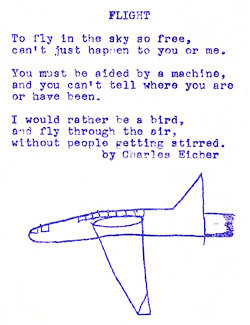 I was always scribbling little pads full of paper with airplanes on them, I was crazy about airplanes when I was a little kid. The teacher traced my drawing onto the mimeograph stencil, I’m sure she missed tracing half the tail, I certainly would not have omitted such a crucial detail. I don’t know, Charles…looks like she got all of the tail. I think that’s a flame coming out of the back via a jet engine.